Our brand new HUD is here. 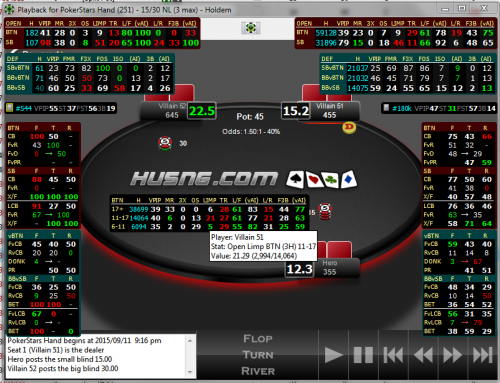 Designed by a new programmer, with the help of veteran sit and go players, comes SpinHUD 2016 a 3-handed sit and go HUD. Included in the purchase price is two HUDs, the regular version, and the version with "vs Hero" stats." Vs Hero stats allow you to see only data from your opponents in hands that they played against you. Our brand new HUD is here. Designed by a new programmer, with the help of veteran sit and go players, comes SpinHUD 2016. Included in the purchase price is two HUDs, the regular version, and the version with "vs Hero" stats> Vs Hero stats allow you to see only data from your opponents in hands that they played against you. Introduction video (below), including stats and information on the HUD. Layout and popup information video (below). Email the programmer Martynas, at spinhud@husng.com with any questions, technical problems or feedback. Within 24 hours after you purchase this HUD, we will activate your PT4 license for access to this HUD, and then your PT4 installation will automatically download and install this HUD. Be sure to completely fill out the checkout form with your PT4 registration e-mail and 6-digit code. You can find that e-mail and 6-digit code in PT4 itself by clicking the "Help" menu and selecting "About". Read about our HUD Guarantee Policy Here.